From Teller and Kaktovik to Shungnak and Tuluksak, Inupiaq photographer Brian Adams has traveled all over rural Alaska for “I Am Inuit.” The project aims to document Alaska Inuit culture and share it with the world through portraits and stories of local people. Brian Adams is a photographer. He grew up in Girdwood, outside of Anchorage, and he traveled to his dad’s hometown of Kivalina as a kid on family vacations. But he really fell in love with the village as an adult. Now, with “I Am Inuit,” Adams does just that: He documents the life and people of villages across Alaska. “Most people, especially in Inuit culture, I’m finding — they’re not used to talking about themselves,” Adams said. Today, Adams is in White Mountain. 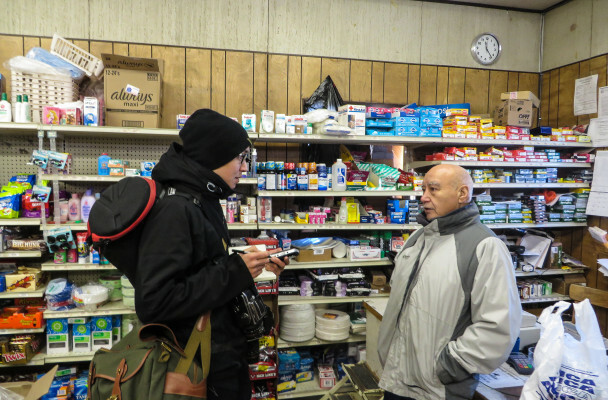 Adams only has three or four days in each community he visits, so he gets to work fast, walking around town and trying to meet as many people as he can. Adams does strike out when he asks to interview the cashier at the White Mountain Native Store. Eventually, he has better luck when he bumps into Karl Ashenfelter, a customer who’s there to buy coffee. Ashenfelter, an elder, grew up in White Mountain. This morning, he said he’s in no rush, so he gives Adams a few minutes for an interview and a photo. Right there in the store, as employees stock shelves and price goods, Ashenfelter tells Adams about his life — how he’s seen the climate change, how much his grandchildren mean to him, even how he defines wisdom. He shares a lot with Adams, but not everything. “BA: Tell me more about your art. You said you’re a painter? KA: I can carve. I can paint. I can do just about anything, really. But I don’t do it anymore. There’s a long story behind that. BA: Do you want to talk a little bit about that? As the interview wraps up, they head outside to do photos in the natural light. Adams has Ashenfelter stand for two portraits — one in front of the Native Store and another along the roadside, as snowmachines buzz by. Coffee in hand, Ashenfelter says goodbye and leaves to go about his day. 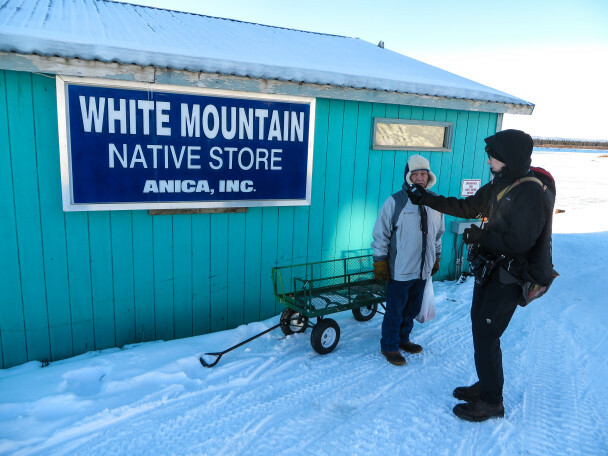 Meanwhile, Adams takes a coffee break himself before getting back to work: Walking around White Mountain, meeting the people who live there, and asking them to share their stories. You can see the photos and read the interviews from Brian Adams’ trip to White Mountain. They’re now up on the “I Am Inuit” website. Adams posts a new picture to website everyday, and he’ll do so until the one-year anniversary of the project on October 26. After that, he plans to publish a book of photos from the project. He also hopes to expand the effort to include Inuit people in Canada and Greenland.